(1) DETACHABLE ITEMS: Take from the boat all removable gear including masts, standing rigging, canvas (like Biminis, dodgers, boat covers), anchors, bow pulpits, antennae, and all loose accessories and items. We cannot be responsible for damage of gear and items that are not properly secured. Electronics and other fixed accessories may be left on the boat however, we recommend securing all such items in a locked cabinet or cabin. The maximum (legal) height for over the road transport is 13' 6". Tenders may be shipped if well secured within the hull. (2) MECHANICAL SYSTEMS: Drain all water tanks. Remember to drain all bilge areas, and other water filled system, particularly if the boat is traveling into or out of a winter climate. Disconnect batteries and electrical systems. On sailboats, remember to secure centerboards. (3) HULL PROTECTION: Boats may be shipped with shrink wrap however, we cannot be responsible for repairs to the cover will in transit. 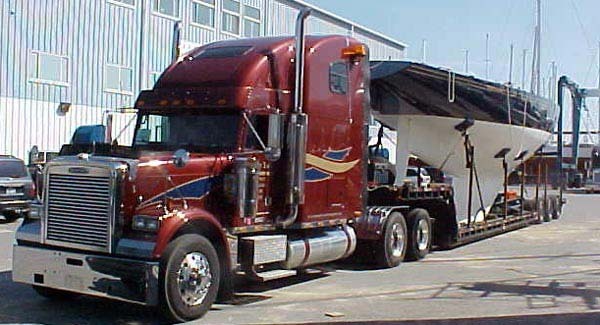 Boats may be secured with other types of covers however it is our experience that these covers will tear and be destroyed during a haul of any reasonable distance. Secure all movable window, portholes and hatches to prevent the wind from forcing an opening and damage to the boat. Sailboat masts should be wrapped with padded covering adequate to protect the hull from road vibration. (4) QUESTIONS: MDI Yacht Transport, Inc.has moved hundreds of boats thousands of miles. We will work with you to ensure that your power boat or sail boat is properly protected from road damage. You'll always receive friendly, personal, helpful service from us! Home Page :: About Us :: OverSize Loads :: Contact Us! We transport America Cup sail boats Freedom and Courageous.